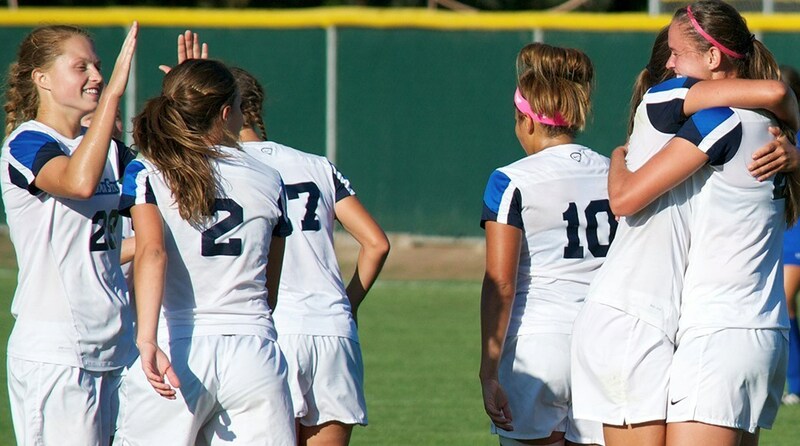 The Sonoma State women's soccer team has been ranked at No. 2 in the first official NCAA Division II West Region rankings released by the NCAA. The Seawolves are looking to qualify for the NCAA tournament for the third time in four seasons after missing the Big Dance last season. The Top six teams in the final West Region rankings qualify for an NCAA postseason berth. The NCAA will continue to release updated regional rankings at NCAA.com every Wednesday afternoon leading up to the Nov. 9 announcement. On the strength of goals by Sara Van Wagoner and Alex Sifuentes, the Sonoma State women's soccer team defeated Cal State East Bay 2-0 on Oct. 25 in front of an enthusiastic Senior Day crowd. The win keeps the Seawolves unbeaten in league play and gives them enough points to capture the first CCAA title in the program's history. The Seawolves improve to 11-1-3 overall and 8-0-2 in the conference. Despite an 18-11 shot advantage in the match, the Seawolves were forced into a scoreless tie with Stanislaus State at the Seawolf Soccer Field on Oct. 23. Both the Seawolves and Warriors earned a point in the CCAA standings. The No. 23-ranked Sonoma State women's volleyball team rolled to a 3-0 sweep of Cal State Dominguez Hills on Oct. 24 at the Wolves' Den for its 12th consecutive victory, a new program record. The Seawolves remain atop the CCAA standings at 12-1, sporting a 16-3 overall record. The Toros fell to 7-15 (5-9 CCAA). The Seawolves took the first two sets with ease and held off a pesky Cal State L.A. squad in the fourth to capture the 3-1 victory (25-17, 25-17, 15-25, 25-23) on Oct. 21 at the Wolves' Den. The win marked the 250th head coaching victory for Bear Grassl. Armando Coronel netted a pair of goals and Andrew Ogilvy scored the other as the Sonoma State men's soccer team got back on track with a convincing 3-0 victory over Cal State East Bay on Senior Day at the Seawolf Soccer Field on Oct. 25. The Seawolves have won four of their last five, improving to 9-5-2 overall and 5-4-1 in the CCAA. The Pioneers fell to 5-10 (3-7 CCAA). The Sonoma State men's soccer team suffered a 2-0 loss to visiting Stanislaus State on Oct. 23, surrendering a goal late in each half, ending its three-match win streak. For the match, Stanislaus outshot Sonoma 21-14, including 9-6 in on goal attempts. The Seawolves are poised for a run at their first NCAA tournament berth since 2010. The Seawolves are ranked No. 7 in the NCAA Division II West Regional Rankings, but need to break into the top six before the 38-team NCAA Tournament field is announced on Nov. 9. The NCAA will continue to release updated regional rankings at NCAA.com every Wednesday afternoon leading up to the Nov. 9 announcement. Following an encouraging start on Saturday, the Sonoma State women's tennis team rolled to five titles at the Warrior Invitational on Oct. 25, with Jensyn Warren, Karlee Budge, Julie Rea, Hillary Fazekas, Kaitlyn Haithcock and Jacquelyn Ward all heading home with trophies after a fantastic effort on the court. This weekend's competition closes out a very successful fall campaign for the Seawolves, who now turn their focus to the spring championship season. Sarah Rotter rolled in a birdie on her final hole to capture individual medalist honors, paving the way for the Sonoma State women's golf team to the team championship at its own Sonoma State Fall Invitational on Oct. 20, hosted at Foxtail Golf Club in Rohnert Park. The Seawolves (612; +36) won their first SSU Invite title since 2008. Maria Hurtado was the first Sonoma State runner to cross the line on Sunday, Oct. 25 at the 2015 CCAA Championship in Golden Gate Park. The senior, who has been the Seawolves' top runner in every meet the past two seasons, finished the six-kilometer course in 23:39.9 to take 76th overall in the conference meet. The Sonoma State women's cross country team finished 11th overall.